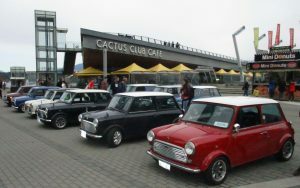 The Jack Poole Olympic Plaza was filled with 25 classic and new Minis celebrating the 60th anniversary of the brand. Photo: Western Driver. Photo: Western Driver. 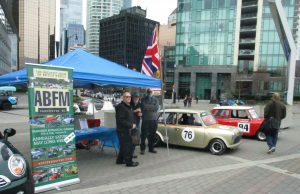 It was a Mini invasion on Sunday March 24, the last day of the 2019 Vancouver International Auto Show (VIAS), when 23 classic Minis and 3 BMW Mini Coopers filled the Jack Poole Olympic Plaza to celebrate the 60th anniversary of the iconic and most celebrated British car. Mini 60 Drive-Up event began at Vanier Park and then proceeded in convoy down Burrard street to the Plaza, creating quite a sight for many bypassers. The display drew large crowds all day, with many enthusiasts sharing their Mini stories—from racing to personal experiences back in the day. Classic Mini race cars were part of the ABFM and BC Historic Motor Races display at the Vancouver International Auto Show. Photo: Western Driver. Just my size! 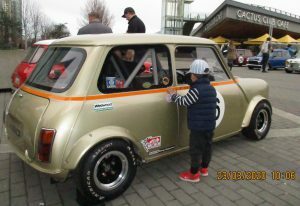 Kids of all ages enjoyed the display of iconic Minis. Photo: Western Driver. event. To see more than 500 British classic cars, be sure to visit The Greatest Show on British Wheels Vancouver ABFM 2019 on Saturday May 18 at VanDusen Garden where both Mini and Bentley marques will be featured. Tickets available at Eventbrite and more details here.